copper post caps - INTEGRITY METAL WORKS INC. 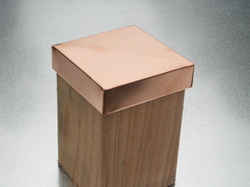 This is a 16oz pure copper post cap, not copper coated. It has 1" legs and is soldered inside. A lasting and attractive way to protect and extend the life of your fence posts. We can also make these out of colored metal.